Bootstrap 3 (and now Bootstrap 4) are amazing CSS frameworks that can make the lives of developers of any skill-level easier. When I was more of a beginner and I first started using Bootstrap, I used every feature of it possible and used to hack it to get things to work the way I wanted. Now, with more experience, I mostly just use their reset and grid system. I now rarely alter any of its core functionality. Bootstrap&apos;s grid system is fantastic and near perfect in my opinion. You can read about it here. I often see developers needing to match heights across columns while maintaining responsiveness. I&apos;ve decided to share some of the methods I do to accomplish this, as well as some very cool tricks other developers and friends have taught me, and the general direction and solution that Bootstrap 4 is doing to address this common problem. If you take either of these approaches, make sure to disable heights on mobile since the columns are all stacked it won&apos;t matter if they&apos;re the same height of not. The word "table" usually sets off a bunch of red flags with front-end developers, but it&apos;s really not that bad when used right. A lot of people don&apos;t even realize you can force div&apos;s and its elements to behave like a table element. You&apos;ll have to adjust this a bit based on what size column you&apos;re using. So it would actually makes sense to create multiple utility classes: is-xs-table-row, is-sm-table-row, is-md-table-row, and is-lg-table-row or just manually make sure you check for responsive. You&apos;ll also notice I adjusted the styles a bit because the columns now have a height (not the custom .box element). If you take this approach, you&apos;ll have to plan for this. It adds 99999px of height to the column via padding and then uses the negative margin to force the position as if it is not there. Then the .row just hides anything that is overflowed. Flexbox is the CSS3 God&apos;s gift to the world of grumpy front-end developers. It&apos;s the ultimate tool for layouts and "gridding" via CSS. You can learn all about it with this Visual Guide to CSS3 Flexbox Properties. There&apos;s only one problem. Internet Explorer browser support is awful. IE9 and below provides zero support, IE10 is a crapshoot with it, and IE11 has many bugs. It&apos;s really only useful to a select few privileged developers, but know Flexbox is coming and here to stay. * And with max cross-browser enabled. * Nobody should ever write this by hand. * Use a preprocesser with autoprefixing. Bootstrap 4 will have two options for it&apos;s grid: "With Flexbox" and "Without Flexbox". If you opt-in with the Flexbox option, the heights are matched automatically. You can read more about it at What&apos;s New in Bootstrap. The problem is still browser support and Bootstrap 4 is, as of writing this, not production ready and in alpha version. Bootstrap 4 also introduced a concept called "Cards". Cards are defined as "a flexible and extensible content container. It includes options for headers and footers, a wide variety of content, contextual background colors, and powerful display options.". Really, all it means is it gives you out-of-the-box Bootstrap styles for the .box demoed in these CodePens. 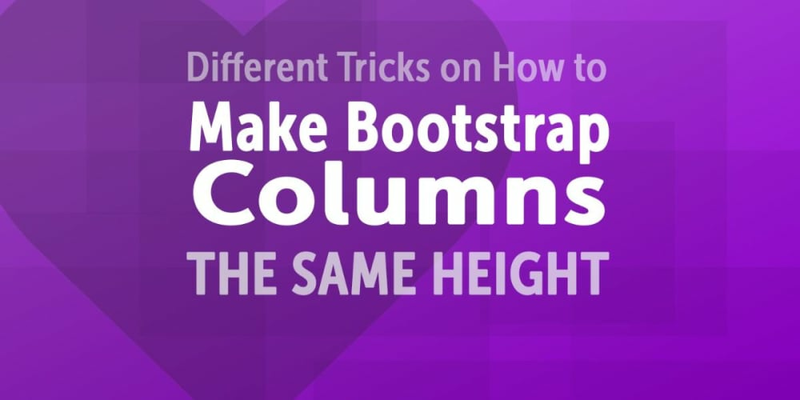 This is really cool though because there&apos;s many options to match height on columns. The only thing is it&apos;s not technically part of the "grid", but is a phenomonal solution for matching heights of columns regardless. What&apos;s cool about Cards in Bootstrap 4 is if you don&apos;t opt-in with Flexbox, it will use tables to trick the heights of the columns to match. If you do, it will use Flexbox instead. This is one of the most exciting things about Bootstrap 4 in my opinion. Bootstrap is simply a framework. At the end of the day, it&apos;s ultimately up to you or the developer to make it work the way you want with your design. You can use all these methods, some of these methods, or whatever. It really doesn&apos;t matter so long you understand the pros and cons. I personally don&apos;t like making CSS adjustments on any base bootstrap thing: .container, .row, .col-*-*. I think it&apos;s too easy for developers to do unintentional things that alter the grid itself (like adding left or right margin or padding) and breaking the default functionality. It&apos;s really up to you though!